I really enjoy when I get to spend an entire article talking about a single card as a case study. I find it fun to break down every single aspect of a card, dissect the possible reasons and explanations behind shifts in price, and use that card as a textbook example for future buyouts, price spikes, or other shifts. My two other written examples of this in the recent past were on Spawnsire of Ulamog and Mindslicer, which were both interesting examples of phenomena in the Magic finance ecosystem with trends that were supposed to be easily predictable. While Spawnsire was alleged to be a purely speculator-driven buyout, the levels of consistent demand that the card has shown since proved its true worth as a casual stalwart in 60-card kitchen table Eldrazi lists that were juiced up by the introduction of Battle for Zendikar. Now that a large number of those players have already picked up their Spawnsires for their non-competitive decks, we can see the demand for the card recede; Oath of the Gatewatch wasn’t nearly as exciting for Spawny. Mindslicer has not been as resilient to decline, but it’s certainly surprised me that the card has not dropped to dollar-rare status after the past two weeks. While none of us will ever know exactly how much money the mystery person made by buying out all of the internet of this stupid 4/3, we’ve already seen the price drop to a more rational level. That’s right, I did say that. The key here is that we’ve finally reached a point in the race to the bottom where other stores are willing to partake in the transactions, and feel safe enough about selling Mindslicers at the new price that they’re putting the card on their buylists. 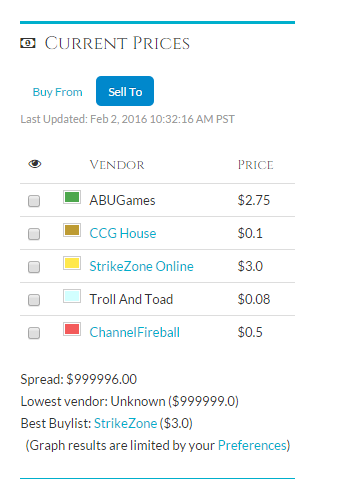 ABUGames (excellent buylist) and StrikeZone Online (eh…) are both willing to take your copies of Mindslicer off your hands, and pay you actual cash dollars due to their confidence that they can resell these copies at the new established price point. While everyone’s initial reaction (including my own) to the Mindslicer buyout was that it was going to fail, crash, and burn back down to bulk, the individual(s) who made the decision to purchase all of the available copies was confident enough that a new price would be somewhat sustainable. 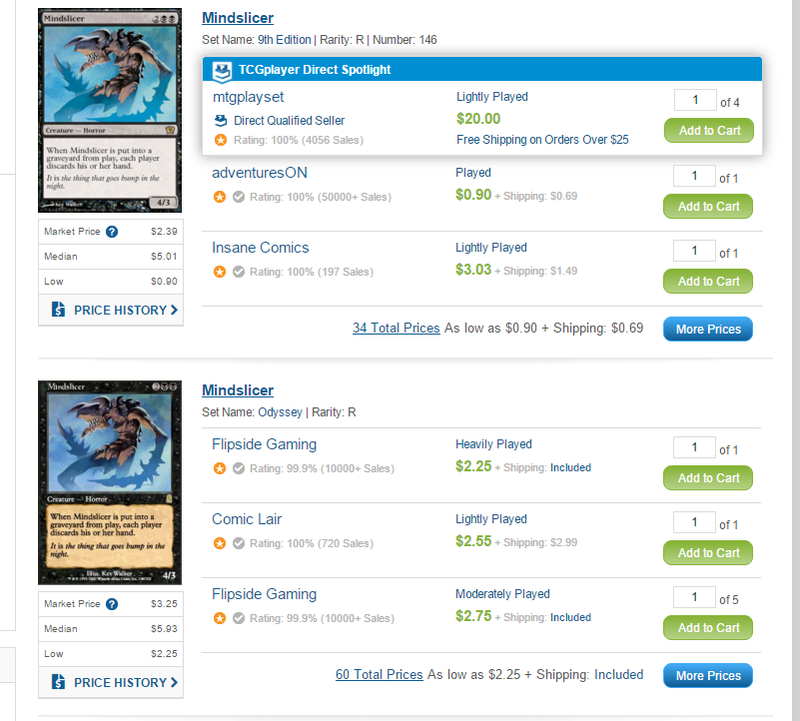 Instead of the good old Aluren example where the card was bought out and then forced back down to its original value due to no true demand, Mindslicer has proven against the odds that it has legitimate demand from stores and players alike. Wait, where was I? Oh, right. I was going to try and write another article about a card in which I’m fairly confident in preparation for the Modern Pro Tour (yes, the same Pro Tour that I said I couldn’t care less about on the latest episode of Cartel Aristocrats). Before I go any further, I’m going to make a tiny, tiny disclaimer. Yes, I own roughly 60 copies of this card. Yes, I recognize that my writing about this card has the potential to act as a catalyst, speeding up the process at which players purchase their copies in a race to lock in their sets before risking supply running too low. For the umpteenth time, I link you to Derek Madlem’s well-written article about The Observer Effect. However… I believe that the Pro Tour and those watching coverage will have a much stronger impact on the price and demand of a card than my content creation here at MTGPrice does. Due to the fact that my article comes out on Thursday, February 4, and the Pro Tour starts on the 5th, you should have plenty of time to buy non-foils of this card if you need them for future Modern endeavors. I would hope that sellers on TCGplayer don’t cancel orders for a card that’s this cheap with such a low expected price jump, but you never know. By the time this article goes live, it will probably be too late to buy foil copies of Spreading Seas. There are zero on eBay below $15, and the ones that are $15 are being shipped all the way from Europe. TCGplayer has a whopping two foils as of February 2, and they were both probably fished out of a toilet. The only online vendor that I can personally find with any reasonable number of copies left is SCG, with twenty MP ones at $7.88 each (disclaimer on the disclaimer: I bought ten SP foils tonight at $8.99 each). For those of you who have been holding onto foil copies in anticipation of a future spike, I suggest selling into any Pro Tour hype you see, and trying to get around $20 for a solid double-up. 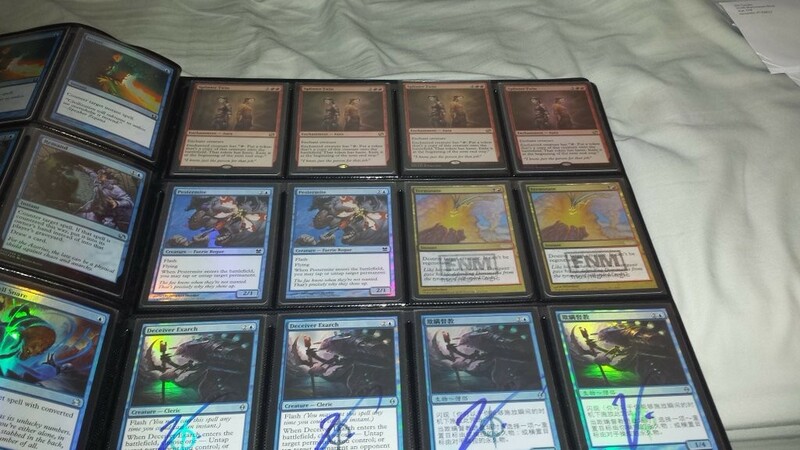 As for the non-foils, there are still at least 500 copies on TCGplayer alone, and another 100 on SCG. 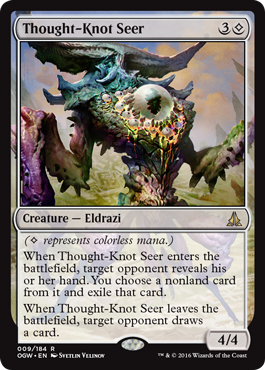 That should prevent any immediate “oh my god, Spreading Seas is a $5 common, the world is ending” tweets. I highly doubt that happens. 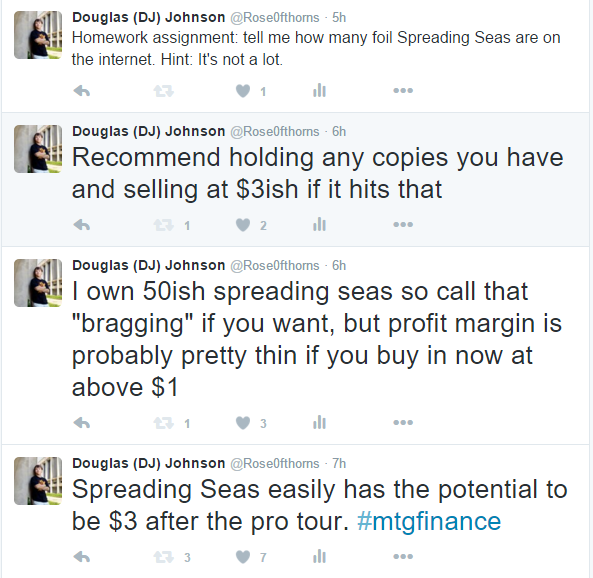 Don’t buy a ton of Spreading Seas at $2 each expecting to make a billion dollars, because you won’t. If you happen to own some non-foils, I would wait and see what the Pro Tour does to the card. 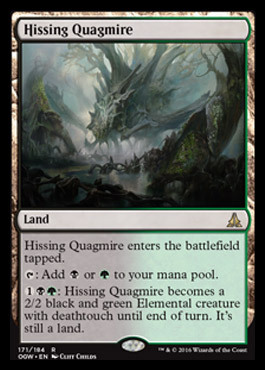 If Merfolk pounds some faces in or an alternate controlling shell shows up housing Seas, then we could be in for a nice little bump, mimicing the trends of Slippery Bogle and Wild Nacatl (speaking of Nacatl, Spreading Seas does an excellent job of making sure that cat stays wet, in addition to washing away the manabases of Tron and Eldrazi). If Seas shows even a drop of on-camera play this weekend, we could certainly see a bump up to $3 to $4 on non-foils in the short term. So what are your other spec targets for the Pro Tour? While I’ll unfortunately be too busy to watch coverage of the event, our own James Chillcott will be providing up to date text coverage to make sure you don’t miss any potential new decks or cards seeing play. Until next week! By then, I’ll be on my way to Georgia, but I should still have an article up on that day to keep you busy. Laboratory Maniac is four times more expensive than you thought he was. “Oh, that card is a silly little dollar rare. It can’t possibly affect me.” WRONG. Card is four freaking American dollars, courtesy of the non-competitive market. Excuse me while I run to the store and pull a dozen of these out of my dollar box before it’s too late. Ad Nauseam is finally starting to perk up from its’ bottom of $2 to $3. If you need these or Phyrexian Unlifes, buy them now. The deck can be very hard to interact with, considering it draws its entire deck for answers to kill the Leyline of Sanctity that you put down. Alright! So maybe I was a little mean in last week’s article, and I apologize for that. I’m a little bit frustrated from trying to explain some concepts to people repeatedly, and I wanted to vent it through satire. My message seemed to get a little lost in translation, so let me reiterate the primary point that I wanted to nail down in the midst of all the Modern “buyouts”. I’m also in agreement with the statement that we finance writers can be a catalyst for a card’s price increasing. Again, Spawnsire is a pretty good example of that. While I remain adamant that Spawnsire would have ended up a $9 card regardless of my articles, I’ll accept that my writing probably caused it to jump a few weeks sooner than it otherwise would have. I neglected to mention our effect on the market, which Derek Madlem summarizes very well here when referring to “the observer effect.” I missed an opportunity to elaborate on that in the content I wrote last week, and accept that mistake. However, the disagreement starts here. I’m really getting tired of the old, “Rabble, rabble, speculators are making Modern prices extremely high, rabble, rabble.” The shadowy cabal that turned my stack of 100 Heartless Summoning into 100 Benjamins does not have the power to profit by making powerful Modern cards jump by ridiculous percentages and stay at those prices without actual demand. What. Alright. This card will work, I guess. 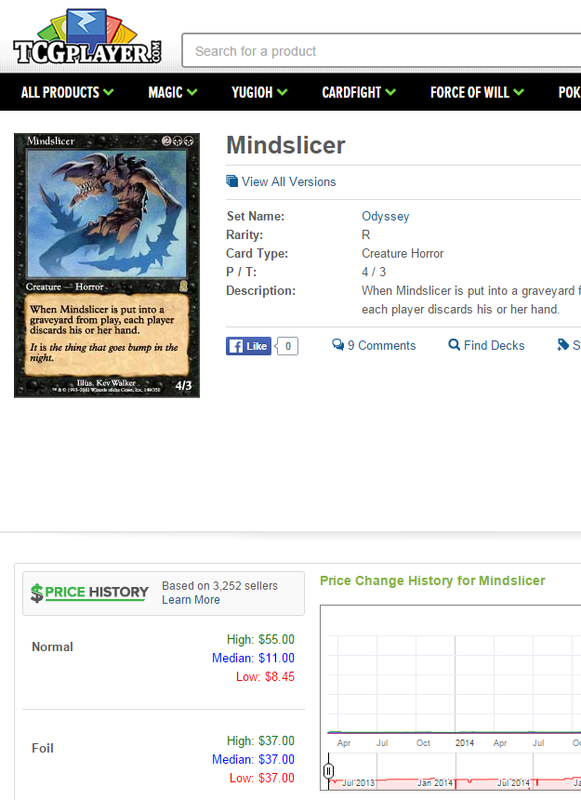 Even MTG Stocks itself is disgusted at the Mindslicer spike, so it refuses to show us the card image on the page. Oh, you didn’t notice? That’s probably because my replacement drawing is basically indistinguishable better in every way. Well, let’s get to work and do some research, to make sure we didn’t miss anything. I’ve never seen a Mindslicer cast in Modern or Legacy in my entire life, although it is pretty fun to cast in a B/G/X Commander deck. 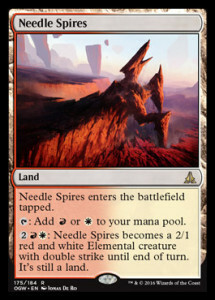 However, there’s absolutely no way that the “new” Meren deck is enough to cause this kind of movement. I wonder if the pros are testing some sort of super secret tech involving Mindslicer, Lyzolda, Savra, and the five pieces of Exodia? That’s the only other rational explanation that would drive someone to actually believe that there’s reason enough to expect a higher price point. Maybe a pro like LSV is planning on shaking up the format now that Twin is out of the picture. So there’s no spicy new Commander demand, at least according to EDHREC (the most reliable compilation of EDH/Commander decks that I’m aware of), and LSV made a joke about that card. 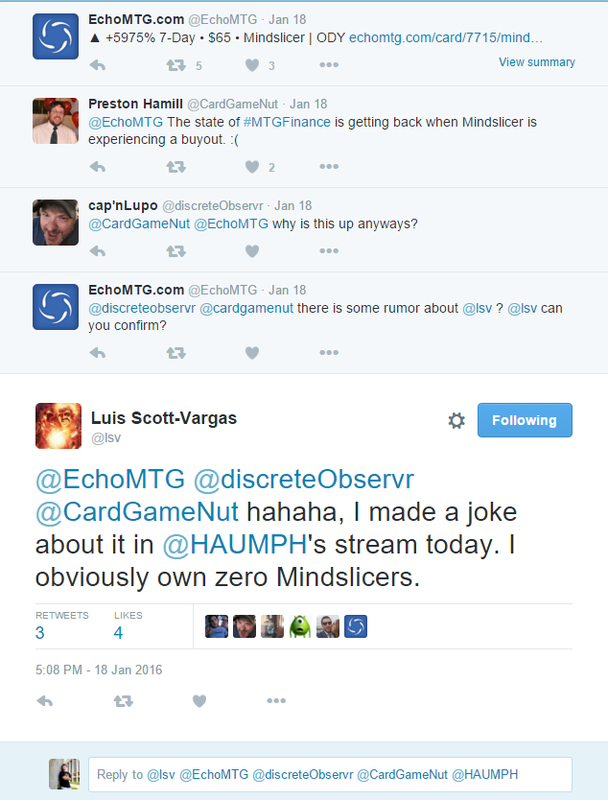 One or more psychopaths drank the kool-aid and felt that LSV was being serious. If only we could look into this guy’s mind and see what he was thinking while he was rolling his face around on the keyboard in a combination of clicks that allowed him to fill his cart with Mindslicers and hit “Confirm Purchase”. Thankfully, we have a cameo from your favorite old-man Commander-durdle writer to provide a comedic spin on some historical precedent. 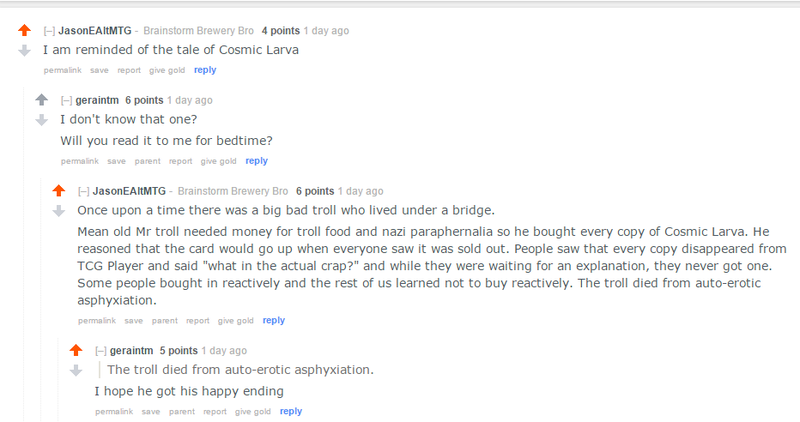 I wasn’t a part of the public finance cartel at this time, so I don’t remember the Cosmic Larva buyout as clearly as Jason Alt. That all changed yesterday during our Cartel Aristocrats podcast, when we brought up the topic of Mindslicer. 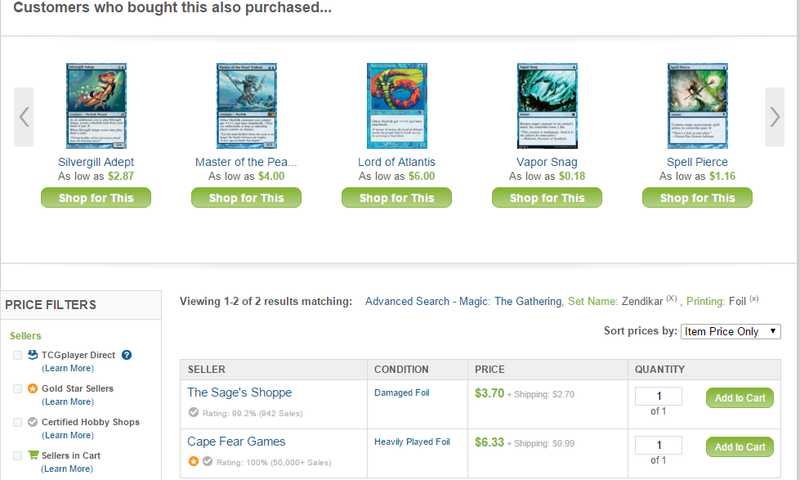 Travis pointed out something I had forgotten about; that you can check the price of the last sold listing on TCGplayer if you have a seller account. 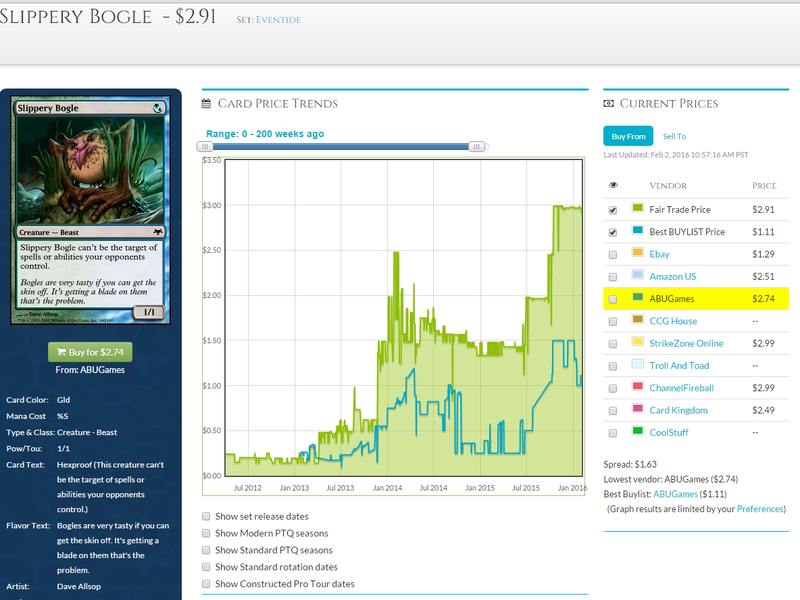 That reminds me: you should probably get a seller account on TCGplayer, even if you don’t currently sell cards. All it takes is a bank account, phone number, and email address, and you can be set up relatively quickly. Even if you have no plans to sell cards at the moment, you’ll have your account ready to sell in the future if you want to quickly liquidate cards that spiked, like Mindslicer, and even if not, you’ll have access to this information regardless. Wait, don- … Why wou-… Alright, then. 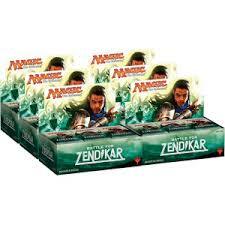 So someone needed a playset of Mindslicers at $9 a piece. That’s… interesting. 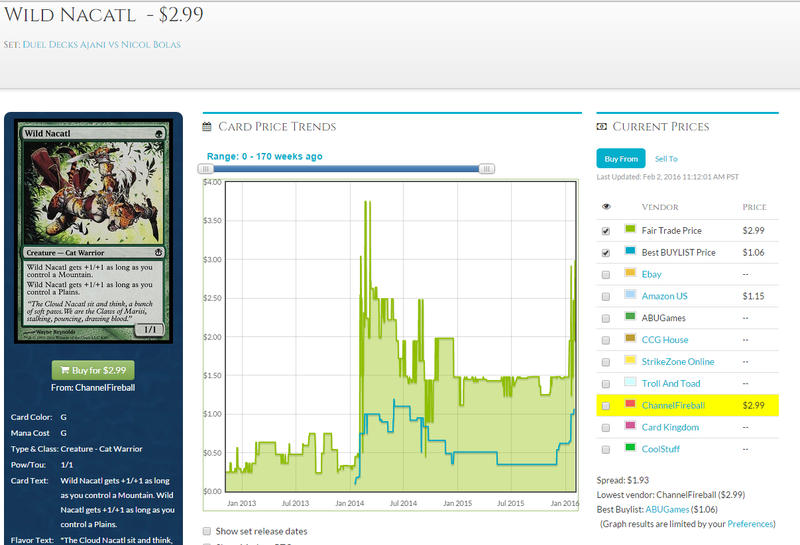 And according to the “last sold listings” for the Ninth Edition and Odessey versions on TCGplayer, people have purchased non-foil copies of varying conditions $7, $8, $9, and $10. On the cast, Travis even said that he saw the last sold listing hit $30 for a single copy. I don’t understand. This was supposed to be a “lol, someone tried to buyout Mindslicer and is going to fail miserably” moment, but human beings are actually buying this card with no evident reason. There’s no unstable decklist that was leaked onto the internet that was supposed to be hidden tech for the Pro Tour, no Travis Woo character streaming and encouraging people to buy. There’s nothing. I see tons of users on Facebook, Twitter, and Reddit suggesting that this is going to crash and burn with no buyers, but there’s still at least one person drinking the Kool-Aid and buying copies. The guy who bought this card out should absolutely be criticized. I’m not trying to defend him, or suggest that buyouts like this are a positive thing in the community. However, the blame is not entirely on our spooky speculator if Mindslicer sticks at a price that is above a couple dollars. For whatever unholy reason, there were multiple people who bought into Mindslicer at the $7 to $10 range. That’s demand, regardless of why they bought it or their mental capability to grasp long-term consequences. If Slicy finds a nest in the $4 or $5 range two weeks from now, that means one of two things has happened. People continued to buy into the card well after the initial craziness wore off, and the woodworkers who pulled these out of binders/decks settled on a reasonable price, while Master Buyoutmancer ships out copies to various stores at the new price, proving that a consistent number of people are willing to accept the new price and establish it as a norm. The remaining copies from the woodworkers run dry, and players stand their ground while refusing to buy at the new price. Buyoutmancer is left with a stack of god knows how many pieces of cardboard that he can’t make money off of without refusing to lower the price back to a rational number. Then he gets to use them as toilet paper while he suffers from explosive diarrhea because he’s too poor to eat anything other than low-quality chinese food for the rest of his days. I’ll talk a little about Modern because it’s all the haps these days. You know them hip kids and buying out the internet and whatever. The worst part about these graphs is that the Grove of the Burnwillows one isn’t even as high as it should be. Almost every store that MTGPrice.com pulls price information has stagnated because they are out of stock (it is common practice not to update the prices on sold-out cards). 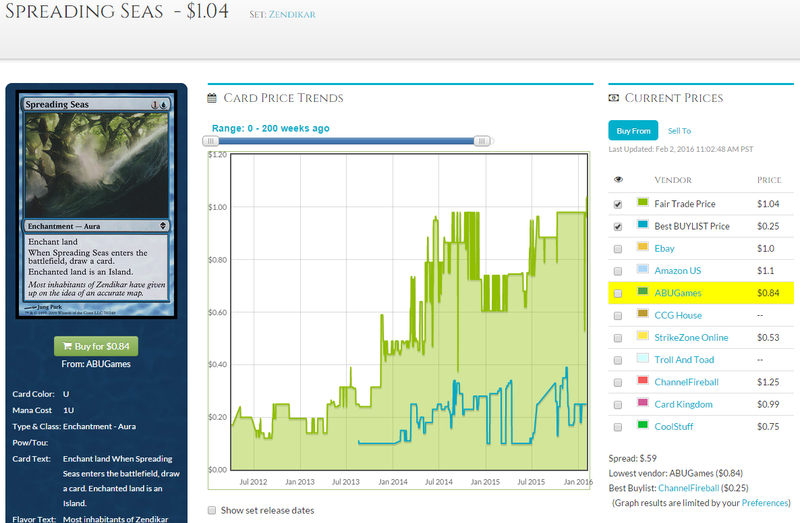 Let’s look at the less steady but technically more accurate TCGPlayer prices. You know what’s really bad about this? Convergent Mid and Low pricing. With big shakeups like this even though the mid pricing seems to dip a little, copies are still being bought. A steady price between mid and low indicates supply and demand are satisfied at this price point. At the end of November that all changed and we haven’t settled since then. 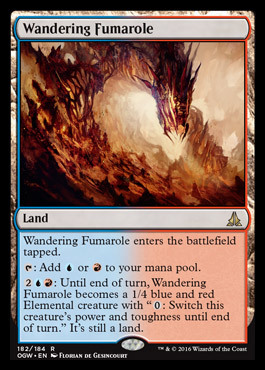 It’s insane to think that the most expensive dual land in a pair of colors is not the ABUR dual. Hence the title of my article, Grove of the Burnwillows is strictly better because of the formats it is legal in and it’s interaction with Punishing Fire. Which brings me to my first point. Excuse my French but that is the truth. A lot of people are picking up Modern decks and playing them because of great strides to reduce the cost to play. 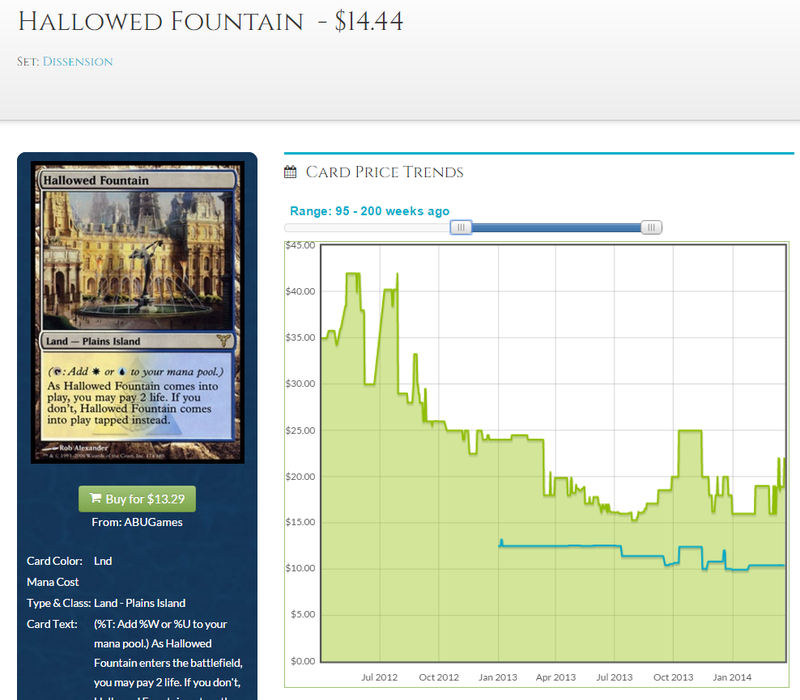 Do you remember the time when Hallowed Fountains were $45? Modern was in it’s infancy and barely anyone played it. Do you know how bad had they not reprinted them with such vigor 3 years ago? 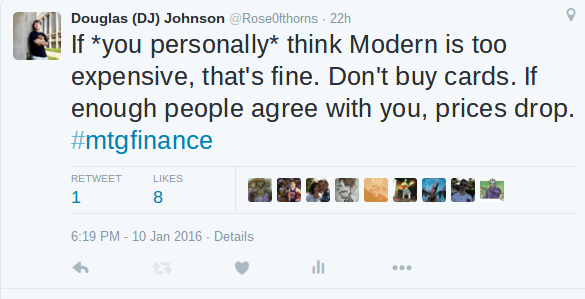 If you think Modern is expensive now, let me tell you, it could have been so much worse. Fetchland reprints in Khans of Tarkir also brought some needed reduction to the cost of Modern but that also made cards more expensive. People knew the writing was on the wall for Bloom. 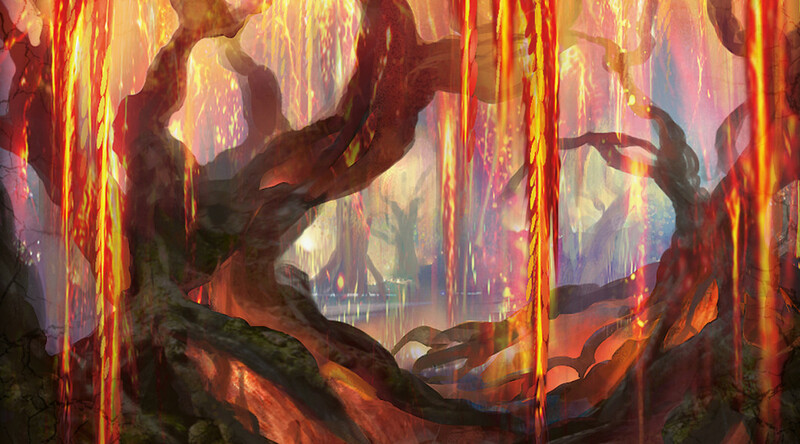 The deck defied some ground rules for the Modern format but getting blindsided by a Splinter Twin ban is causing some really bad panic buying. Scapeshift is the easiest deck you can port Twin into (most of the shell is similar) but Scapeshift isn’t a card that got reprinted 6 months ago. The original printing is from Morningtide which is even older (and smaller print run) than the original Splinter Twin printing. The ripple effect will continue until probably a month after the Pro Tour as people try to figure out what to play now. The security knowing the “pillars of the format” is lost in Modern now and we might see a cascade of price changes as people adjust their strategy. At this point unless you need to play in a Modern event until Shadows over Innistrad, I would just stop buying Modern cards. But this ban brings new brews! Yeah, maybe? 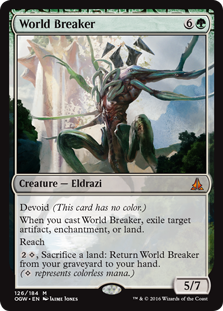 To be quite honest, the Eldrazi deck is already bringing enough of a shake up to Modern I’m not sure we needed to ban Splinter Twin. While it’s true the boogie man that was Twin allows for other decks to flourish, if you couldn’t beat Twin what makes you think your brew can beat the remaining decks? I think people think that removing one of their bad matchups all of a sudden makes their deck playable. What I am expecting is the opposite. If your brew couldn’t beat a 3 mana 1/4 blue creature it probably can’t beat a lot of the decks in Modern. While this is a finance column, I can not advocate people go out and buy a new deck right now because the format will be very unsettled. These two are likely to become a dynamic duo in Standard in the coming months. They have both seen non-stop upward movement since their very early spoiling. If you got in early you are probably feeling great but at this point I think I’d rather trade for them than buy copies. Baring an unusually high finish (or large percentage of the top 8/16), they will likely not see a big jump next weekend. This guy has been gaining the past week also. 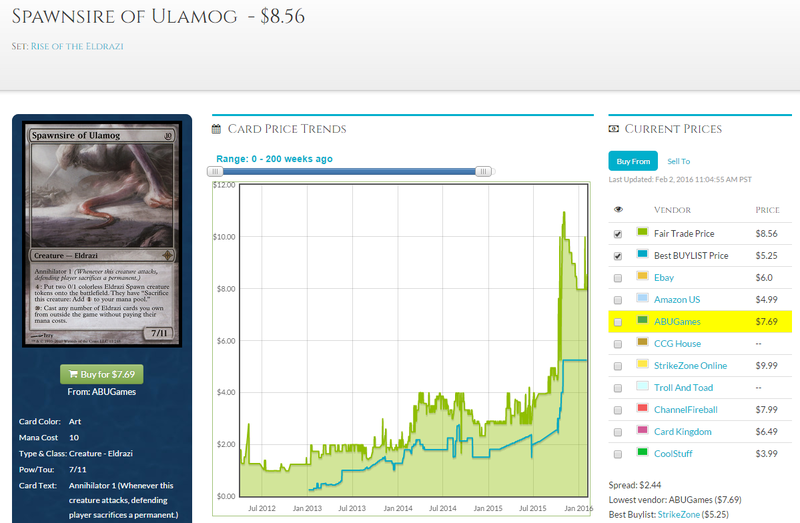 He probably won’t see as much play as Ulamog (Kozilek is much worse in multiples) which means he probably can’t maintain a $18-20 price tag for very long. I expect him to dip in the coming months and I’m a buyer at $10-12. 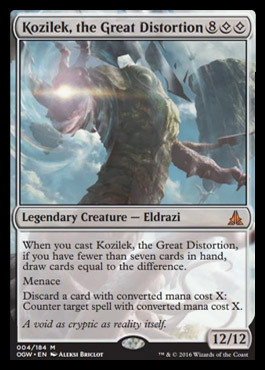 Kozilek, the Great Distortion (like Kozilek, the Butcher of Truth) will likely retain a higher price tag than he should due to being a casual favorite. The only thing I can think that may change this course is if some Tron team at the Pro Tour adopts a large number of Kozilek in the main deck. That will probably lead him to disappear from the internet in a few hours. The best card in the set. I regret not pre-ordering these at $4, $7, or $8 because the internet thinks they are worth $15. I’m not interested at that point. 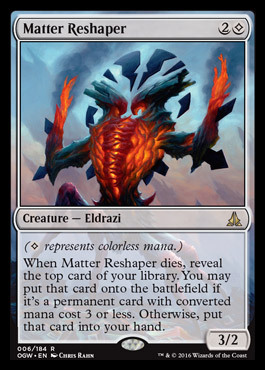 I’m not sure it’s good enough for Standard and Modern demand likely won’t push it close to the price of the rares of the Eldrazi deck. My rule of thumb is it can’t be more than Ulamog or Eye of Ugin. If you need them for a deck, I’m sorry but you probably wont find a better deal at $15 so good luck. This is a potential “sleeper” of the set. I’m not sure how much upside there is at $5 but if you like the cut of his jib I wouldn’t fault you for getting yours. Outside of Cracking Doom, nobody is really set up to kill this guy. I’m totally on board buying all of these lands. They’re $2-3.50 each which is in the ball park that the lower man land (Lumbering Falls) from Battle for Zendikar dropped to. If these get a lot of play in Modern and EDH… Well I guess really it’s “when” they get a lot of play, they will go up. There are not a lot of choice of good enemy colored dual lands. Some people swear by this guy, and on paper he looks pretty good. The reality is he’s actually pretty difficult to cast unless you reshape your mana a lot to support it. I’m not sure people will and I’m not on board buying into a $7 rare. This is one of those “I have to see it to believe it” kinda cards. But I’m not always right, I felt that way about Collected Company before that was $15. This is the last card I’ll touch on. He’s great. He’s $2.75 but he’s the buy a box promo. I would not fault you for buying or trading for some. I may have done it myself. 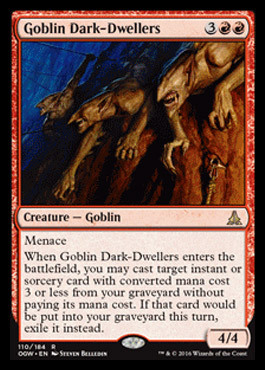 While this unlikely another Goblin Rabblemaster, he’s got enough value on a sturdy body to be around for a bit. So you guys know I used to advocate Pucatrade. It was a fantastic service. Was. 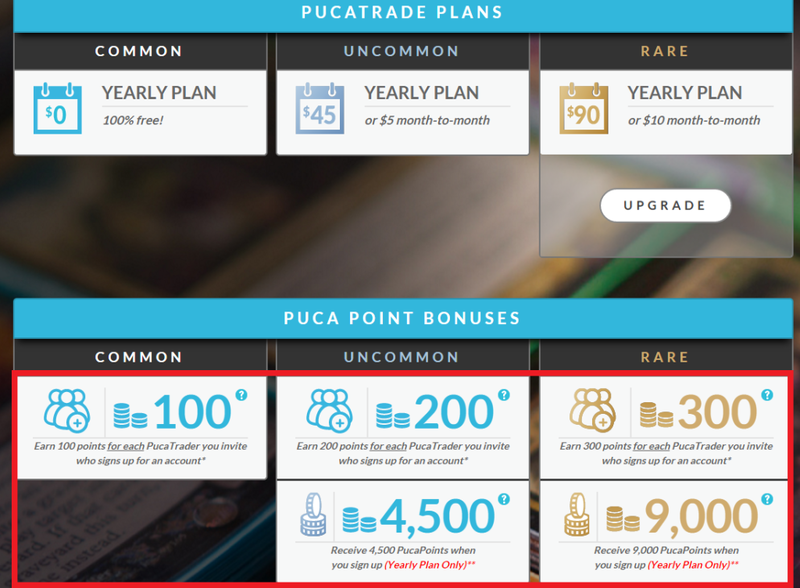 This is the current Pucatrade plan page. They have tripled the bonuses you get for signing up for paid plans and have the same bonus for new referrals. That’s a huge amount of additional Pucapoints flowing into the market that will cause more inflation. At this point I don’t think there is an upside to using Pucatrade because there is such a large possibility people just stop sending you cards. The fact that at this point, your entire Puca subscription cost turns into pucapoints is VERY concerning. 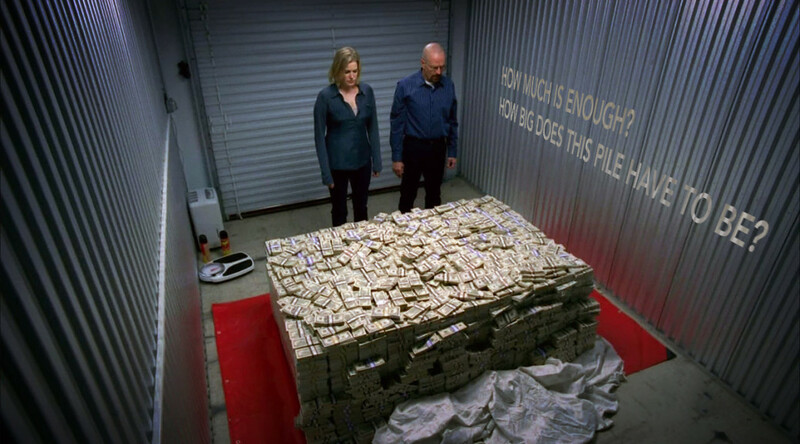 Without a way to take them out of the market it’s possible pucapoints just turn into Zimbabwean Dollars. It is just a really bad way to get caught with your pants down. I don’t know if the new website will fix these issues but it should be pointed out as something to watch. Thanks as always for reading, hopefully if my weekend goes to plan and you’re watching the StarCity open in Atlanta you will see me on camera! Gotta keep up the facade that I play more Magic than every other writer on this website, right? JA: Ahem. I now call the weekly #MTGFINANCE cartel meeting to order. Let us waste no time; time is money, and we all love money. The masses are still angry over the Gaddock Teeg spike a few weeks ago, and they have rightly decided to point blame at our shadowy cabal. However, this fury and passion from the average player is trivial in our grand plan. The sheep shall have no choice but to buy our $75 Auriok Champions, drawn in by the money machine named “Modern.” While they may recognize there is puppeteering behind their pathetic children’s card game, it is impossible for them to pin down who exactly is pulling the strings. They are forced to submit to the almighty addictive power of this game, and we shall become infinitely more wealthy with each passing day. Now, will each of the cartel members present his successful market manipulations? 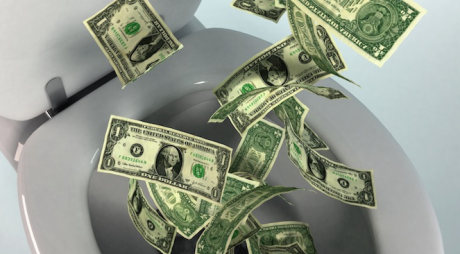 The sooner that we finish our reports, the sooner we can begin to bathe in the money pit. DJ: My Heartless Summoning plot worked brilliantly. The weak-minded fools still believe that I only bought 100 copies one year ago, instead of my actual purchase: 100,000 copies in the past week. 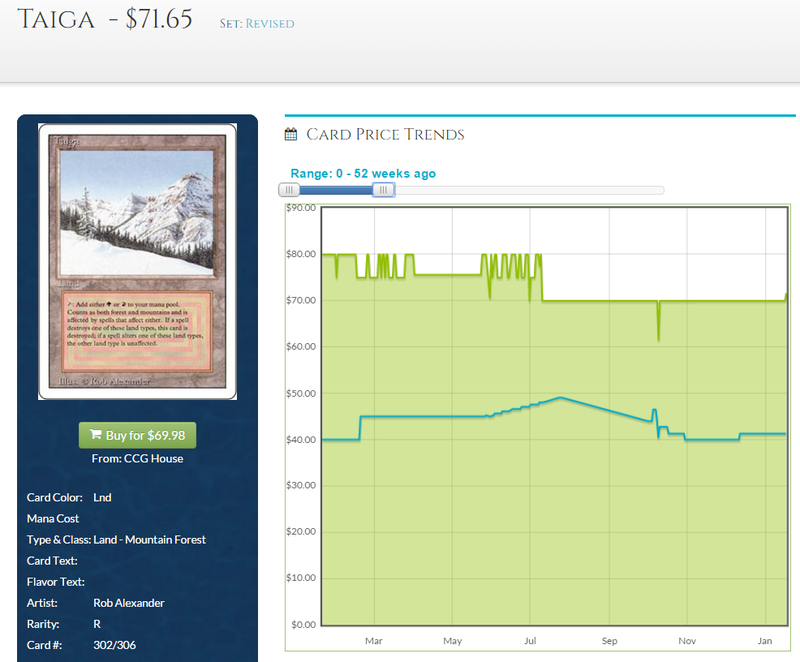 I have personally manipulated the price up to a stable $6 TCGplayer mid from the minuscule 50 cents that it was mere weeks ago, and I will slowly trickle my cards back onto the market as planned. $60,000 was a small price to pay those couple of mindless drones to play the Heartless Eldrazi deck and generate hype for my scheme. No one actually wants to play that pathetic pile of 75 cards. My estimated profit from this buyout is… a lot of money. 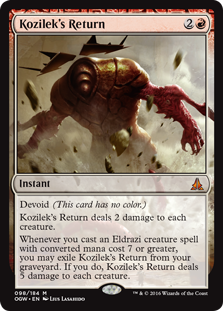 TA: On a similar note, the Inquisition of Kozilek buyout marks another success in our plot to force the price of that Eldrazi deck into the four-digit range. While the piles of cash that I acquired from this single-person buyout is a cute way for me to pay for my newest fleet of Ferraris, the true reward is the unmatched arousal I feel when reading the complaints of the poors. We can continue to blame the players for this spike, even though there is only one recorded instance of another human being wanting to build this black Eldrazi deck. Everything is coming to fruition, and I plan to spike Inquisition of Kozilek once again in approximately four days. JC: Day 1456: The players still believe that I am one of them, and I have gleaned much information about their laughable cognitive processes and dissociation from basic economics. My test post on the Hype-Generation Subreddit was successful, and confirms a new weapon in our arsenal for manipulating the price of Magic: The Gathering cards that have zero competitive applicability in any format. Spellskite is now a $40 card for no reason whatsoever, and despite there being no actual demand for the card, some smoke and mirrors have led to this new price being set in stone. But hey, I’m not sure such a small spike is worth my time, so instead of releasing my 600 copies onto the market, I will distribute them throughout the office as coffee coasters. On another note, Johnson, you owe me half of your 400 Spellskites as a result of our wager. 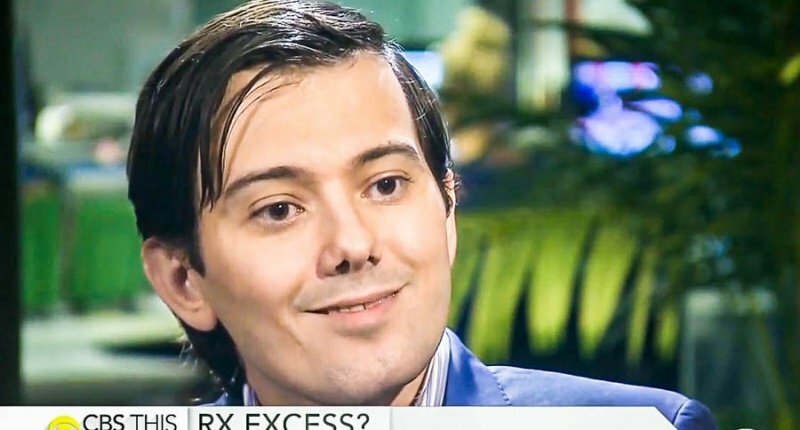 I have bested you in fair and honest #MTGFINANCE combat, and you will uphold your end of the bargain. JA: Shut up, CH. We will now adjourn to the money pits. Meeting adjourned until January 12, 2016, at exactly 1:30 a.m. EST. The true face of the #MTGFINANCE cartel…. ‘Sup nerds? 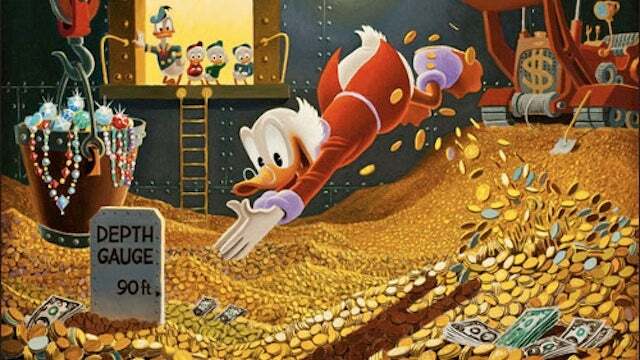 You may remember me from my masterpiece article like five months ago, and now I’m back again to shed some light on the Magic financial world when it needs me most. You already know why my expertise is needed, right? Prices have been absolutely crazy over these past few weeks, and I’m here to save the freaking day and expose the evil Cartel Aristocrats for the market manipulators that they truly are. The above documentation with the fancy slanted lettering is a perfectly accurate transcribing from their most recent secret meeting. 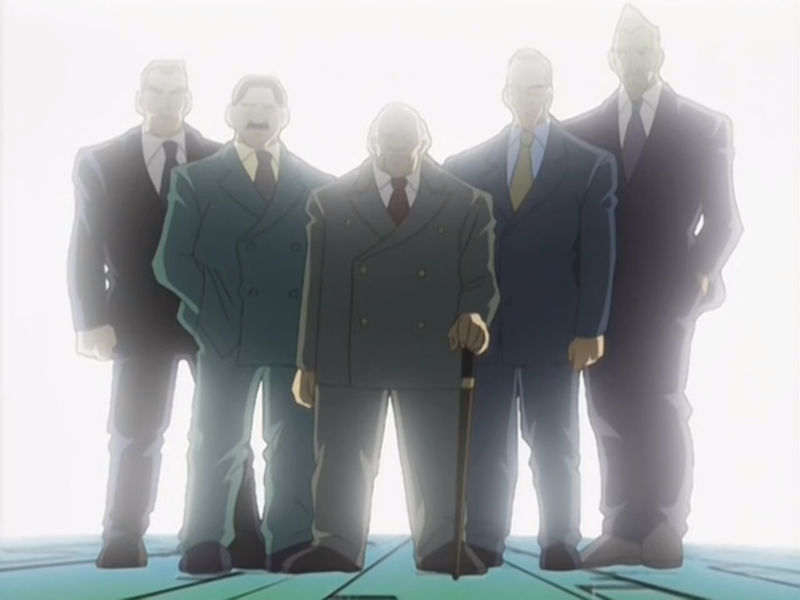 I managed to sneak in by disguising myself as one of them, which wasn’t hard considering how insanely rich I am. Also, who is this peasant people keep talking about? What’s that? One of the guys in there has “DJ” as his initials? Yeah, don’t worry about that. No relation. Dude was freaking handsome, though. Seriously, drop-dead gorgeous. But me? I was just a fly on the wall, writing down some serious #MTGFINANCE truths to drop on you, the precious reader. As you can tell by my daring journalism efforts that would put Corbin Hosler to shame, these buyouts are real. 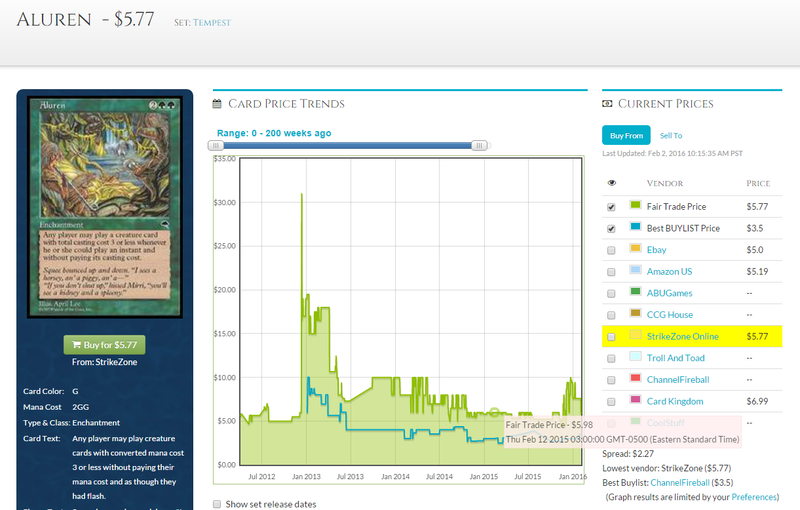 I mean, sure, I tend to buy and sell a bunch of Magic cards on a level that would make most of you weep, but buyouts…? I would never partake in such an evil, organized effort to isolate a certain card on the market and purchase all of the copies available for hopes of selling it for more later on. While buyouts are an effective way of making easy money, today I fight for the people, and the player. These buyouts are obviously a concerted effort by an organized group of fat cats at an attempt to ruin #MTGFINANCE for the rest of us, while simultaneously making themselves very rich. (Maybe even richer than me, and that’s something that I just can’t stand for.) I will help you all stand up against this shadowy cabal of evil speculators, and I’m not even going to charge you for it. What a benevolent writer I am (although I’ll probably definitely put it down as a tax-write off)! So let’s work together and get Heartless Summoning back down to 50 cents. Don’t worry though, we won’t stop there. We’ll get Inquisition of Kozilek to drop back down to its’ original price of $13, because there’s no true demand. After all, Modern season doesn’t even start for a couple of months! How could anyone possibly need copies before that? Don’t worry, ladies and gents. I possess a secret strategy honed by a combination of practice, training, and natural-born talent. Every single plan has a fatal flaw, and I know exactly how to make their empire crumble. 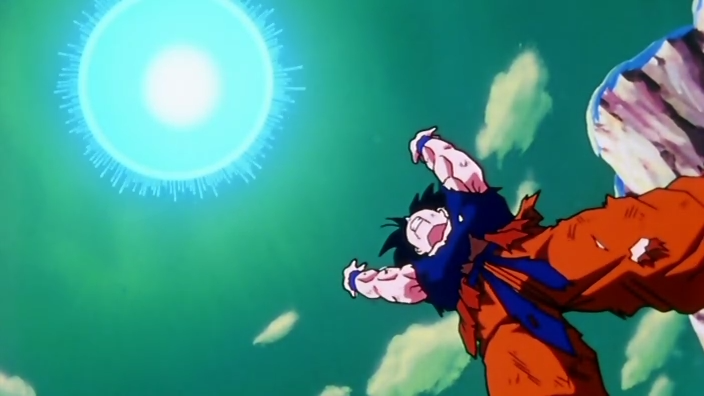 We can take down these speculators, together, with the power of teamwork!!! Fortunately for us, these multi-billionaire speculators have one fatal weakness that will be their ultimate downfall: “Don’t buy cards.” That’s it. As long as you don’t purchase their cards at their inflated prices, then they don’t get the satisfaction of swindling you out of your hard-earned cash dollars (I mean, you should still buy my cards, but don’t buy theirs. Trust me). Now here’s where the real magic happens. If Spooky Speculator A can’t sell Spellskites at $40 and wants to make her money back, she has to drop the price, maybe to $38 or so. If we all work together and hold up our metaphorical picket signs and say, “We won’t pay your outrageous price on Spellskites! This card should be $1.30,” then the price drops even more, because the cartel has to move copies in order to make money. While this will be difficult, it’s theoretically possible. Here’s an accurate scientific model of all of us working together to beat the cartel financiers. Now, I said before that every single strategy and plan has a weakness. Unfortunately, that includes my brilliant anti-marketing scheme. If somehow I got my intel wrong (not likely), and somehow these price spikes were caused by actual player demand… then there would be an issue with our heroic plot. True player demand would suggest that our unified boycotting efforts were meaningless, because some psychopaths actually bought the cards to play with in their decks. Our powers of friendship and teamwork will be useless to stop these people from buying copies to play with at the new prices. However, I’m sure we have nothing to worry about. None of these buyouts generated from low supply, player demand, or people wanting to prepare for a format. 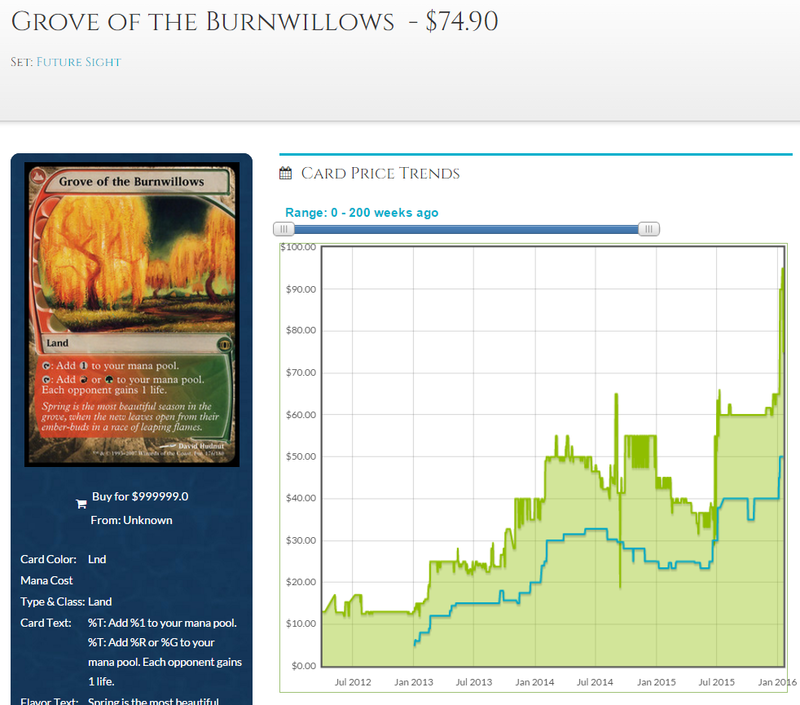 It was all #MTGFINANCE speculators. Trust me: I saw the cartel speak and share stories with my own eyes.